Cinemablographer: Who Knew Dirty Harry Could Be So Sappy? Who knew that Dirty Harry could be so sappy? There's Bridges of Madison County, yes, but Clint Eastwood's Meryl Streep movie is a beast of overwhelming tragedy. Sully proves that Eastwood directs a film with economy, finesse, and efficiency, but it reveals that sentimentality really isn’t his strong suit. It’s true that Mr. Eastwood makes grown men cry with the masterful knockout punch of Million Dollar Baby, yet Sully is so awkwardly lame that one may shed tears for different reasons. Sully is Eastwood’s War Horse. It proves disappointing to find Sully so cringe-worthy since the subject, pilot Chelsey “Sully” Sullenberger (played by a sturdy Tom Hanks), deserves a film portrait from someone of the calibre in which Eastwood was working right through to 2009. The film chronicles Sully’s undeniably heroic feat of 15 January 2009 in which he used decades’ worth of flying experience and true grit to land a failing commercial aircraft on the Hudson River. All 155 passengers and crewmembers survived, the film shows with this brave tale. The crash is absolutely terrifying and it’s a marvel that anyone survived, as Sully reveals in some thrilling flashbacks as the pilot relives the ordeal. These sequences show Eastwood in his element as both the technical finesse and the intense realism of the scenes put the audience in a cabin controlled by two men drawing from great experience. In these scenes, Sully lets the audience witness a hero’s bravery while riding shotgun and it’s an impeccable feat. Sully, however, isn’t quite as brave as the man who shares its name. For a biopic about a man who risked 155 lives, including his own, it’s an awfully safe film. The real problem here is the mawkish and didactic screenplay by Todd Komarnicki, which struggles with the human element that Sully ultimately champions in an eleventh-hour pitch to clear his name. 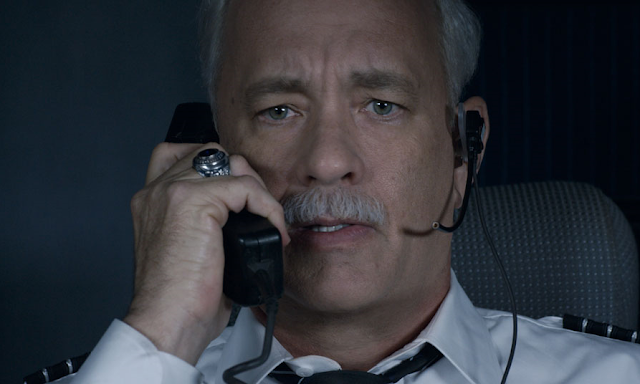 Komarnicki (whose previous writing credit is 2007’s Halle Berry bargain bin thriller Perfect Stranger) certainly displays a laudable effort of research in terms of the protocols, habits, and behaviour by pilots and flight crew during a crisis, but Sully is very awkward as it tries to squeeze drama out of an astounding feat that ended happily for most parties involved. The plane hit some birds. The engines failed. It had an emergency landing. The passengers got a little wet and chilly, but everyone pulled together and survived in a miraculous stroke of timing. Sully tries to make the landing controversial, though, with a heavy-handed storyline involving a hearing from the National Transportation Safety Board that turns into a witch-hunt as some panelists look to take down the perceived hero who grounded one of their planes and put numerous lawsuits on their table. Even a cursory glance at Sully’s story, however, reveals the film’s gross inaccuracy. While dramatic embellishment and creative license are all part of turning fact into fiction, Sully strains the story to the point at which it loses credibility. There’s no need to defend Sully’s actions or use them to manipulate audiences. The trial, however, is just a loose dramatic device that lets streams of Average Joes commend Sully for being a hero. The hearings, however, are nowhere near as big a trial for the viewer as the scenes of Sully speaking on the phone with his wife (Laura Linney) in which blunt sentimentality and tinkly piano music reminds the audience that Sully’s both a victim and a hero in this ordeal, but whatever the error in judgement, the risk was worth it. A sledgehammer to the face could not be as on the nose as Sully is. These conversations come and go with awkward randomness. Even the origami vomit bags from which the Denzel Washington plane crash movie Flight materialised had more finesse. Like Sullenberger, though, Hanks makes the most out of a bad situation. He is resolutely strong as the resilient pilot. His temperament is calm and his manner doesn’t shake. Hanks’ Sullenberger never wavers: doubt flickers on the actors face just to confirm to the hero that he did the right thing. Although Sully has no easy clip for awards night or no bravura moment like the finale of Captain Philips, it shows that, as with last year’s Bridge of Spies, Hanks has a subtle all-American humanity that he can channel into a character with expert ease. Eastwood isn’t quite as subtle with the emotional cues that land about as elegantly as a plane does on a river. Hanks’s strong performance doesn’t find a fair counterpart in most of the film’s supporting members, including some reliable actors, as too many players ham it up for the camera to create a message that the real hero of January 15th was an all-American spirit. It’s fair to see a plane landing safely in post-9/11 New York City as a rallying point, but Sully’s insistence on trucking in so many characters to reiterate the same point, like the hotel manager who gives Sully a warm embrace or a make-up girl who kisses his cheek, are the squarest bits of hero worship one may see. The end credits sequence, finally, which reunites the original crew and passengers of Sully’s fateful flight, is frankly embarrassing as the real Sully gives a post-script pep talk. Eastwood isn’t really one to inspire a group hug and, unfortunately, it shows. Sully is now in theatres.